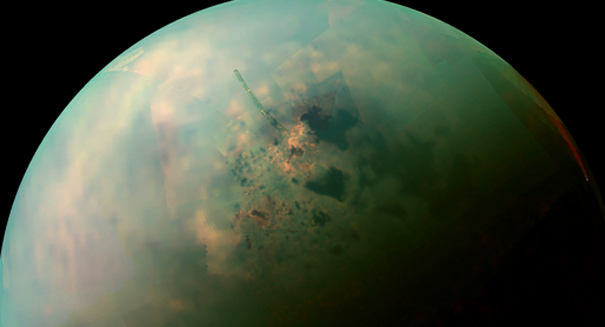 A series of huge mountains on Titan could be a big deal for scientists hoping to learn more about the giant Saturn moon. Scientists have found that Titan’s largest mountains reach dizzying heights, a discovery made possible by NASA’s Cassini spacecraft. The massive moon of Saturn has long fascinated scientists, who have been using Cassini observations to measure the heights of the mountains on the moon, according to a NASA Jet Propulsion Laboratory statement. Scientists were able to use the radar on the spacecraft to cut through the thick atmosphere of Titan and peer into the strange geological features on its surface. They found that the highest peak on the moon was 10,948 feet, and was part of a large mountain range, with many of the tallest mountains coming it at around 10,000 feet. By comparison, Mount Everest is close to 30,000 feet, so Earth still has them beat. But considering that Titan is so much smaller than Earth, that’s still pretty incredible. The largest mountain in our solar system is the Olympus Mons on Mars, which is more than twice as high as Everest, and some peaks on Venus may be even taller than that. The findings could help scientists better understand the tectonic movements of Titan’s crust. “It’s not only the highest point we’ve found so far on Titan, but we think it’s the highest point we’re likely to find,” Stephen Wall, deputy lead of the Cassini radar team at NASA’s Jet Propulsion Laboratory in Pasadena, California, said in the statement.